Gum Paste Satin Ice 2 lbs. Gum paste is a ready-to-use modeling/sculpting paste sugar icing, that is moulded by hand into decorative pieces which over time set hard to the touch. It is used to produce life-like sugar flowers and leaves, elegant ruffles, character figures, and other decorative pieces. The finished pieces will set up hard keeping their shape and may be stored in a sealed container for long periods. Handling: Knead desired quantity of Gum Paste by hand on a smooth, clean surface until the desired consistency is achieved. 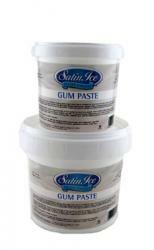 The Gum Paste may be rolled or molded very thin. To prevent drying, always keep Gum Paste covered. Reseal excess product in sealed container. Note: To speed up drying time, cellulose gum may be added to product in small quantities.